Peel and finely chop shallot. Wash herbs, shake them dry, and finely chop. Wash and peel kohlrabi, halve, and cut into thick slices. In a medium pot of boiling water, add some of the eggs and cook for approx. 10 min. Remove eggs from pot, drain, peel, and mash with a fork. To make the sauce: In a large bowl, mix together herbs, milk, shallots, mustard, sour cream, and mashed eggs, until combined. Season with lemon juice, salt, and pepper to taste. Set aside. In a large pot of boiling water cook kohlrabi for approx. 5 – 6 min. Drain and transfer to a paper towel-lined plate to dry. In a small bowl, whisk the remaining eggs together with salt and pepper. On one plate, mix Parmesan and bread crumbs, and add flour to another plate. Wrap kohlrabi slices with Parma ham and dredge them in flour, then beaten eggs, then breadcrumbs. Gently press to seal. Heat clarified butter and oil in a frying pan over medium high heat. Add kohlrabi and fry for approx. 5 min. on each side, or until browned. Transfer to a paper towel-lined plate to drain. 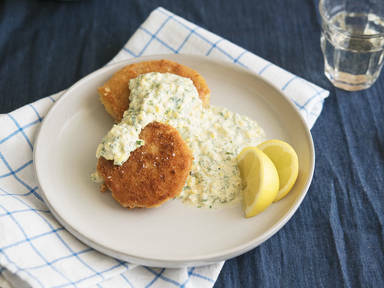 Serve schnitzel with green sauce. Enjoy!